Foil deck to tail patch. 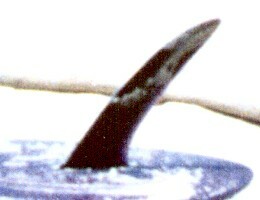 Tail patch.Fin patch. 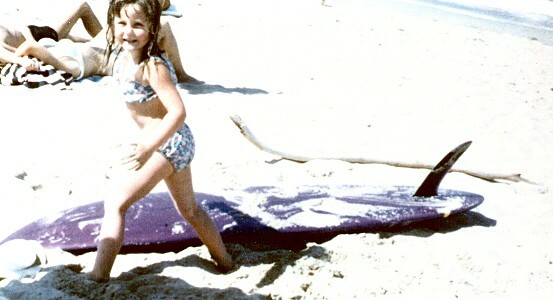 Rocker: Two phase - Marked nose lift to wide point, then flat to tail. 8 1/2 inch x 6 1/2 inch base x 9 1/2 span @ 5 1/2 inches. With stamped serial number, 1562. 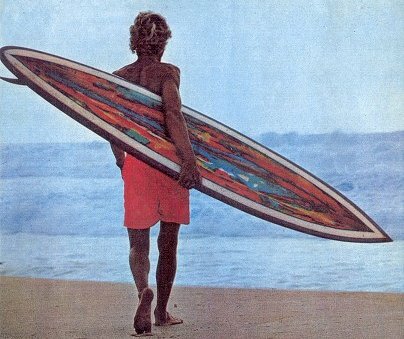 #214 1969 Farrelly, Diamond tail 6 ft 4"
#54 1971 Farrelly Pop-out 5ft 5"
Vol 12 No. 1 1969 Page ? Note similarities in template to #56. 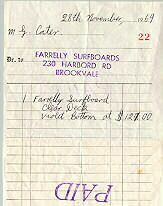 Board # 5 : Farrelly Rounded pintail, 7 ft 6'' Clear deck, Violet bottom, 28 November 1969 Receipt No. 22. 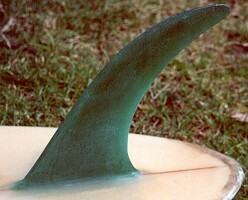 Narrow base fin fibreglassed into fin box - note minimal rovings.